A row of trucks wait to cross the border with the United States in Ciudad Juarez, Mexico, Tuesday, April 9, 2019. 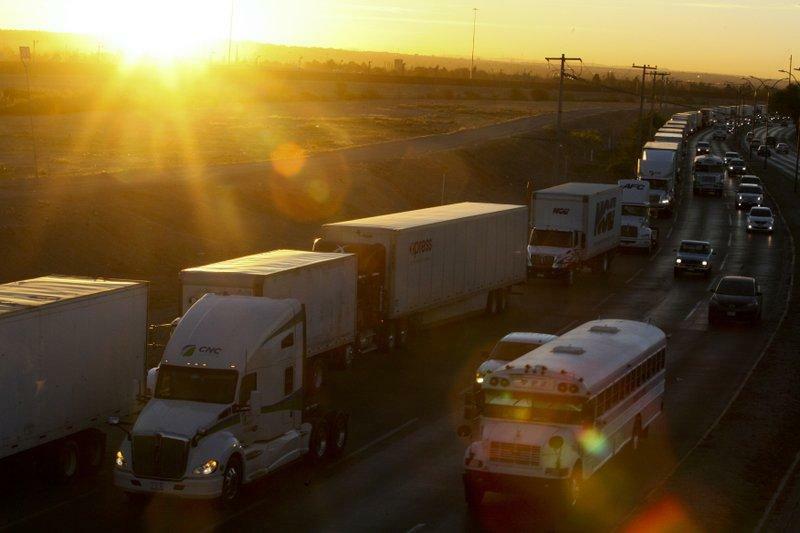 The Trump administration has reassigned so many inspectors from U.S.-Mexico border crossings that it has caused huge traffic backups for truckers who are waiting in line for hours and in some case days to get shipments to the U.S.
"Here we are growing companies and growing jobs and everything is great. We added another industrial park with job prospects in tow and then all this happens," Pacheco said of the latest expansion. "This all started about two weeks ago with Trump," said driver Arturo Menendez, 44, who first entered the line at 4 a.m. Friday with his tractor-trailer full of cardboard used in boxes for U.S.-made products like Toro lawn mowers. Avila, who is also the San Diego Regional Chamber of Commerce's vice president for international affairs, said the delays could encourage more companies to move to Asia, hurting jobs in the U.S. and Mexico. Animal are integral to the ceremonies of many Native Americans in the Southwest. KNAU’s Ryan Heinsius reports, Arizona wildlife managers have now begun a program to collect certain items like tortoise shells and distribute them to tribes. Wildland fire forecasters are predicting some higher activity for parts of Arizona. Government officials and non-governmental organizations that help immigrants must do a better job coordinating and communicating about the needs of immigrants in the country illegally who are increasingly being released onto the streets after their detentions, Sen. Martha McSally said Monday.